Never let it be said that The Legal Genealogist is jealous. Except when The Legal Genealogist is jealous. Downright green with envy, this time around. 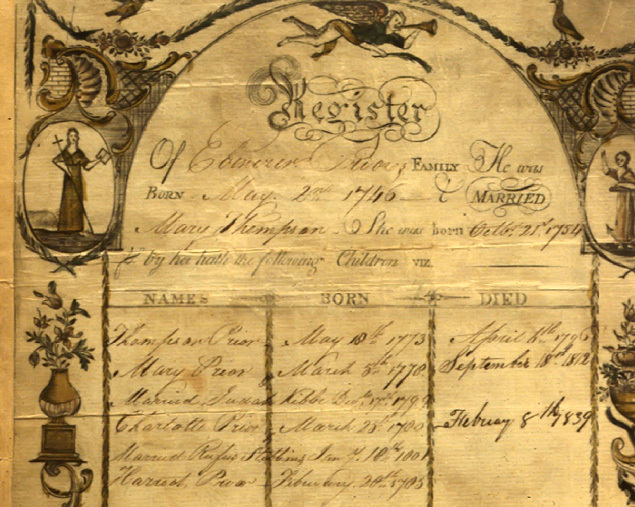 And it tells us that Ebenezer Prior was born on the 2nd of May 1746 and married Mary Thompson, who was born on the 21st of October 1754. They had four children: Thompson, born 18 May 1773, and died 6 April 1796; Mary, born 5 March 1778, married Judah Kibbe 17 December 1799, and died 18 September 1812; Charlotte, born 25 March 1780, married Rufus Stubbins 18 January 1801, and died 8 February 1839; and Harriet, born 28 February 1785. All in glorious illustrated color. For anybody to download and enjoy. Now you could find this on the Archives’ website, archives.gov. It’s there for the taking, if you know how to find it and even know to look for it there. Or you could look at it, and 112 others, in a single collection called “Revolutionary War Frakturs” in the photostream of the National Archives on a website called Flickr. Flickr, for those who aren’t familiar with it, is a free photosharing website that anybody can use. It bills itself as almost certainly the best online photo management and sharing application in the world2 and it has a paid pro subscription option for those who choose to use it. And the National Archives has so chosen. Right now, the National Archives has some 16,000-plus images in its Flickr collection, with items ranging from the illustrated Frakturs to a set of stereographs to a collection on women’s suffrage to documents from the New Orleans Custom House. And those Frakturs? They are just amazing. Oh, you’ll get these pages if you order the Revolutionary War pension files of any of these men or widows. Or look at them on Fold3.com. Where you’ll get and see them as they were reproduced on microfilm. In black and white. But if you want to see them in full color, with browns and reds and greens and blues, all 113 of them in one place, you need to go over to that Flickr photostream. The best part? The National Archives isn’t the only archive that has a Flickr account. Take a gander at The Commons on Flickr — where more than 100 repositories from around the world have chosen to showcase some of their very best freely-available items. From the Texas State Library to the Provincial Archives of Alberta, Canada, to the National Museum of Denmark to the National Library of Ireland to the State Library of Queensland, Australia, there are some treasures to be found. I’ll be busy sitting here turning green. Sigh… couldn’t one of my ancestors have sent in something like this…? Yeah, I’m jealous too. I’ve never found any for my German ancestors. Thanks for the links – I do keep forgetting to look in unusual places like Flikr. Probably running off with my ancestors, Sue! Thank you for posting this link. I do have an ancestor in this collection. I had previously seen it in a pension record in black and white. I used it to prove my lineage to this ancestor with DAR. It was really nice to see it in color. I’m very jealous — but glad you had a chance to see the color version.